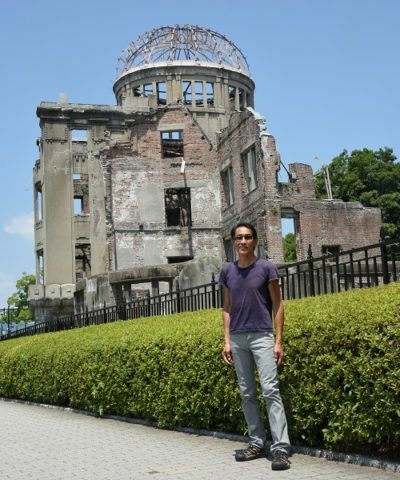 Sharat G. Lin, in addressing the International Anti-war Anti-nuke Rally in Hiroshima held on August 5, 2018, offered a resolute apology for the U.S. government’s dropping of the atomic bombs on Hiroshima and Nagasaki in August 1945. He called it a “monstrous war crime” that must never be allowed to happen again. He called for universal nuclear disarmament that must focus first on the U.S.A. and Russia. On the 73rd anniversary of the infamous U.S. dropping of the atomic bomb on Hiroshima, there are many memorials, rallies, and marches taking place in Hiroshima, both official and those organized by grassroots peace and justice activists. Sharat G. Lin, representing the San José Peace and Justice Center, addressed the International Anti-war Anti-nuke Rally at the East Ward Cultural Center in Hiroshima held on August 5, 2018. In calling the U.S. dropping of the atomic bombs on Hiroshima and Nagasaki “monstrous war crimes,” he offered an apology from the people of the United States to the people of Japan for “the most concentrated instantaneous mass killing in human history.” He called for universal nuclear disarmament starting with the U.S.A. and Russia, which have by far the largest nuclear weapons arsenals, rather than focusing exclusively on North Korea and Iran, of which neither have started any wars in the last century. It is truly an honour to be able to speak to you today at this International Anti-War Anti-Nuclear Rally here in Hiroshima! I come from the San José Peace and Justice Center in California which was founded 61 years ago precisely to challenge the growing threat of nuclear weapons and nuclear war. Tomorrow is the 73rd Anniversary of the atomic bombing of Hiroshima by the U.S.A. Sadly, today we still face the threat of nuclear annihilation from irresponsible powers. It is absolutely not true that the atomic bomb was necessary to hasten Japan’s surrender and “save American and Japanese lives,” as we are so often told. Not only was this the first use of the atomic bomb on a living city, but it was the most concentrated instantaneous mass killing in human history. This was a monstrous war crime, only to be followed by a second monstrous war crime on Nagasaki only 3 days later. We now know that Emperor Hirohito, despite his militarism and war crimes, was reluctantly prepared to surrender well before the atomic bombings on the condition of preserving the institution of the Emperor. His offer was communicated to Soviet Premier Joseph Stalin to be conveyed to U.S. President Harry Truman in June 1945. The infamous decision to drop the atomic bomb on Hiroshima in spite of Emperor Hirohito’s offer served only to assert U.S. military pre-eminence, to test the bomb on a civilian population, and to nip in the bud Soviet entry into the war against Japan in an attempt to deny the Soviet Union any role in negotiating the post-war order in East Asia. So today, I am going to declare what no U.S. president has been willing to declare. I am going to say something that the present government of Japan also does not want to hear for fear that this will give a boost to peace and anti-war activism in Japan. On behalf of the vast majority of the American people who want to see a world without nuclear weapons, I hereby apologize for the United States dropping the atomic bomb on Hiroshima and I again apologize for the United States dropping the atomic bomb on Nagasaki. The U.S.A. remains the only country to ever use nuclear weapons in a first strike on human populations. This is an apology from the people of the United States to the people of Japan. I may not have the legal authority to make this apology, but I have the moral authority to make this apology, for moral authority stands above legal authority. We bypass our callous governments to say that all nuclear weapons must be dismantled, not just those in North Korea, and not just those that we are trying to prevent in Iran, but all nuclear weapons starting with the strategic nuclear arsenals of the U.S.A. and Russia, and then those of China, Britain, France, India, Pakistan, Israel, and North Korea. Speaking of North Korea – the Democratic People’s Republic of Korea (DPRK) – I recently visited North Korea to find out what the country is really like. To my surprise, it is much more different from what our governments and media tell us than I had ever expected. Despite what we are relentlessly told about “starvation and deprivation” in North Korea, there has not been a famine since the Arduous March famine of 1994-1998. There is no homelessness since state-owned housing is provided to all free of rent! While the state is undeniably authoritarian, the incarceration rate is half that of the U.S.A. and half of the police in North Korea do not even carry guns. So why is North Korea being so demonized and targeted with relentless sanctions, non-recognition, attempts at regime change, and provocative military exercises? In contrast, nuclear powers and proliferators like Pakistan and Israel receive unparalleled support and military aid. Both have refused to rule out first use of tactical nuclear weapons. Now the Korean people, starting with South Korean President Moon Jae-In and the Winter Olympics, have made a new beginning where they have stood united as one people against militarism and for cooperation and peace. We stand here today in full support for the Korean people’s right to self-determination, reunification, and peace through negotiation between the two Koreas! No to war! No to all nuclear weapons (not just some nuclear weapons)! No more Hiroshima! No more Nagasaki! No more Fukushima! No to depacifying the Constitution! No to U.S. bases in Japan! No war on North Korea! No war on Iran! Yes for peace, equality, inclusion, the environment, and social justice! • Sharat G. Lin is a research fellow and past president of the San José Peace and Justice Center. He teaches and writes on global political economy, migrant labor, war and peace, public health, environment, and arts in social activism. The San José Peace and Justice Center is a grassroots organization educating, organizing and advocating for social justice and peace locally and globally. It was founded in 1957 to raise awareness and oppose the growing dangers of nuclear weapons. Read other articles by San Jose Peace and Justice Center. This article was posted on Sunday, August 5th, 2018 at 6:08pm and is filed under Crimes against Humanity, Hiroshima, Iran, Korea, Nagasaki, North Korea, Nukes, President Kim Jong-un, President Moon Jae-in, United States, US Lies, US Military Bases, US Terrorism, War, War Crimes.